"A baby fills a place in your heart, that you never knew was empty"
Absolutely, hands down, without a doubt......capturing baby & family within hours after baby being brought into this world is my favorite time to be behind the lens. I LOVE newborns, but I LOVE, LOVE, LOVE them when they are brand new and FRESH. To be a fly on the wall and witness mom, dad, and their closest family adore and swoon over baby's perfect wrinkly nose, pink skin, and hair can only be described as special. These newborn photography sessions aka "FRESH48" take place in the hospital or birthing center sometime during the first day or two after birth. I emphasize capturing baby's sweet, brand new details that will be gone in just a matter of days, and the bond that is forming between parents and baby. This session was no exception! Actually, I shed a tear of joy after learning that Blake made her debut. I captured maternity photos for this family, and followed the last few months through details provided by mom on Facebook.....it choked me up knowing how thrilled Blake's mom and dad were to meet her!! Smiling at her momma!! I snapped this while waiting for the doctor to finish up talking to mom. I hadn't even began to manipulate my camera settings because I had just arrived, and the overhead light was still one (I use window light mostly) But when she started smiling so big, almost giggling, at her momma I had to seize the moment and hurry to get a shot!! 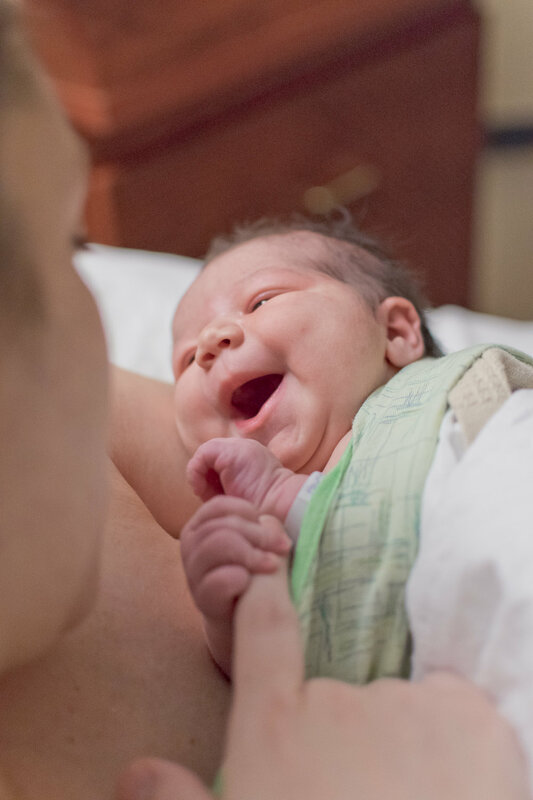 Because who cares about setting your camera when there's a smiling newborn! It's one of mom's "forever favorite" photos---as it should be!! Daddy taking it all in---his beautiful, baby girl!!! Another reason I enjoy hospital sessions..........As a Registered Nurse for several years, I am extremely comfortable in the hospital rooms. This helps a lot when I need to maneuver the furniture/beds to get a shot....it's second nature;) Safety, hand-washing, being up to date on my immunizations, and keeping germs away from your new bundle of joy are also second nature because I'm a Nurse. It was such a joy capturing these fleeting moments for mom and dad. Be sure to check back soon for a little peak into Blake's studio session, they brought her to my home for some more photos around 7 days old. Contact me to schedule your newborn photography session today, it is never too early to book to ensure my availability. I offer bundles/discounts for booking a hospital session along with a studio/posed session.